Confounding from population structure, extended families and inbreeding can be a significant issue for burden and kernel association tests on rare variants from next generation DNA sequencing. An obvious solution is to combine the power of a mixed model regression analysis with the ability to assess the rare variant burden using methods such as KBAC or CMC. Recent approaches have adjusted burden and kernel tests using linear regression models; this method adjusts for the relatedness of samples and includes that directly into a logistic regression model. 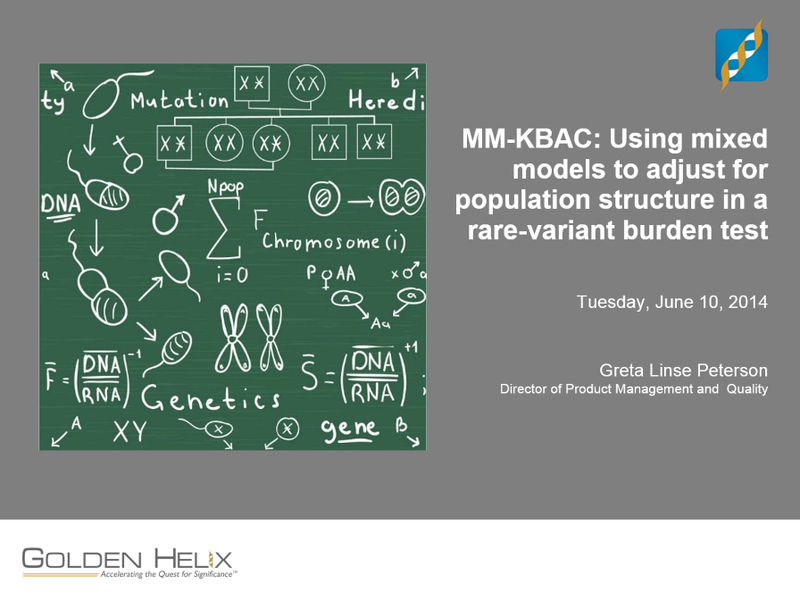 This webcast will focus on the details of bringing Mixed Model Regression and KBAC together, including: deriving an optimal logistic mixed model algorithm for calculating the reduced model score, how the kinship or random effects matrix should be specified, and how it all comes together into one algorithm. Results from applying the method to variants from the 1000 Genomes project will also be presented and compared to famSKAT.